As the implications of the high-level review panel report on the State Security Agency continue to ripple through South African society, calls are growing for swift action against those officials implicated by the report. The State Security Minister claims that criminal consequences are on the way – while President Cyril Ramaphosa appears to be focusing on the bright side of a potentially cleaned-up state security apparatus. One recommendation of the high-level review panel set up to investigate the State Security Agency (SSA) was unambiguous. The President should instruct “the appropriate law enforcement bodies” to investigate the “manifest breaches of the law” revealed by the panel’s report, “with a view to instituting, where appropriate, criminal and/or disciplinary prosecutions”. It has only been two days since the Presidency released the report, but calls are mounting for swift action to be taken on the basis of the report’s bombshell findings. Although the report was published in a redacted form, it is clear that those heavily implicated include former president Jacob Zuma, former State Security Ministers David Mahlobo and Siyabonga Cwele, former department director-general Arthur Fraser, and former SSA special operations head Thulani Dlomo. Of these men, only one has made any public statement on the report. Former president Zuma hit back in a Sunday tweet in which he claimed that the review panel included “two well known apartheid spies”. Mahlobo, who is currently an ordinary ANC MP, told Independent Media that the report did not implicate him, because it did not “make references to any name”. A spokesperson for Fraser similarly told News24 that Fraser was “studying” the report for evidence that he was indeed implicated. Cwele and Fraser still occupy significant posts in government, with Cwele currently serving as Home Affairs Minister and Fraser as Commissioner of Correctional Services. Dlomo, meanwhile, was recalled as South Africa’s ambassador to Japan in February. The Democratic Alliance has called for “the immediate suspension from public services of all those implicated” in the report. Zwelinzima Vavi’s South African Federation of Trade Unions (SAFTU) took things one step further on Monday, demanding “the immediate arrest of Jacob Zuma, Arthur Fraser, Siyabonga Cwele, David Mahlobo together with all those that assisted them”. These individuals, said SAFTU, should be charged with “defeating the ends of justice including possibly for treason against the people of this country”. 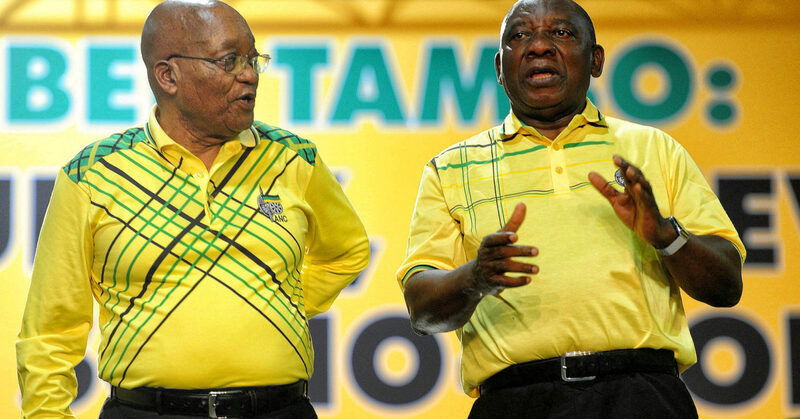 ANC alliance partners the Congress of South African Trade Unions (Cosatu) adopted a more moderate tone, calling on President Cyril Ramaphosa to “act against all those who are implicated in this report”. Cosatu also singled out Mahlobo, stating that the former minister “should be held accountable for the deterioration, corruption and anarchy that took place at SSA under his watch”. Yet although President Ramaphosa received the report in January, the recall of Dlomo from his ambassadorial post has been the only public evidence of disciplinary consequences for the report’s villains thus far. Interviewed by reporters in Johannesburg on the 2019 elections campaign trail on Monday, Ramaphosa expressed satisfaction at the panel’s work. “[The report] has now been discussed, and actually it has been discussed thoroughly by the people in the state agency itself,” Ramaphosa said. “I am now relaxed that we are now on a really good, strong path,” the President continued. Ramaphosa would not comment on any planned disciplinary action, and the Presidency has not made any further statement on the matter. State Security Minister Dipuo Letsatsi-Duba assured the public via radio station 702 on Monday morning that things were happening behind the scenes, however. “The report itself recommends that wherever there are indications of wrongdoing in terms of criminality, we must immediately hand them over to the law enforcement agency, which we are busy with, to make sure that people are accountable for what they did,” Letsatsi-Dube said. But there will need to be firm evidence of such “handovers” to reassure the public that the rogue actions of the SSA exposed by the report are being taken seriously. Local NGOs expressed a mixture of outrage and vindication at the report’s findings that Dlomo’s special operations team had spied on activists and civil society organisations – a claim that has been made by state security watchdog Right2Know for several years. “We firmly believe that these rogue securocrats are a threat to our democracy and they must be dealt with accordingly,” Right2Know said in a statement. Greenpeace Africa, which was named in the report as one of the NGOs targeted by the SSA, said that it condemned the surveillance revelations “in the strongest possible terms”. “This is a clear abuse of power aimed at damaging the work that NGOs like Greenpeace Africa do to bring about social and environmental justice in South Africa,” executive director Njeri Kabeberi said. The Council for the Advancement of the South African Constitution (Casac) was another group mentioned in the report as having been on the SSA’s radar. “We were obviously prominent in the fight against maladministration, corruption, State Capture and undermining of the Constitution by the Zuma administration, so our activities would have been of interest to them,” Casac director Lawson Naidoo suggested to Daily Maverick. Though no comment on the matter was available from the South African National Editors’ Forum (Sanef) on Monday, the report also fingers local media as potential targets – or pawns – of the SSA. It states that the SSA’s special operations including “infiltrating and influencing the media in order, apparently, to counter bad publicity for the country, the then president [Zuma] and the SSA”. No further detail is provided in the redacted report, but a 2018 book by panel member Professor Jane Duncan, titled Stopping the Spies: Constructing and resisting the surveillance state in South Africa, contains the example of intelligence officers intercepting the communications of then-Sunday Times journalists Stephan Hofstatter and Mzilikazi wa Afrika. Journalist Jacques Pauw, meanwhile, who exposed many aspects of the SSA’s malfeasance in The President’s Keepers, said on Facebook that he had been targeted by Fraser since the publication of his book. “Every time I did a speaking engagement last year, [Fraser] sent agents to monitor what I said and wrote down the registration numbers of cars of people that came to listen to me. He listened to my phone calls,” wrote Pauw.